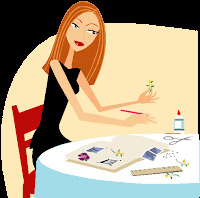 I am crafty in many ways, but I have never actually completed a scrapbook.I get all jazzed and buy a bunch of scrapbooking stuff and then it all collects dust in my basement closet. Same with card making, invitation creating, and baby books. I love it...when someone else does it. So, when My Memories contacted me about using their new software, My Memories Suite v.3 and "trying" to create (and finish) a project, I was skeptical but up to the challenge. When they told me I would be able to give away a copy of the software to a lucky reader it totally sealed the deal. My Memories has 3 different software versions. 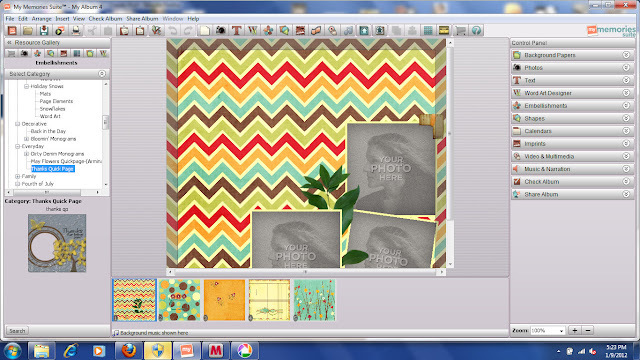 The one I used is a general software you can use to create photo books, scrapbooks, cards, invitations, personalized calendars, and anything you can imagine. Imagine photoshop for a lot less ($39.97 -use my $10 off and you can get it for $29.97) with tons of "stuff" to use to decorate and create completely original keepsakes. You can move around the different layers of the pages and have the freedom to create exactly what you want and even print it at home! THE BEST PART....you can add music to your design too! Off I ran to their website and downloaded the software. You know I love playing with graphic design stuff...hence the 13 blog design changes and 129 1/2 buttons I have used here at Too Much Time. Of course I started this at 9 p.m. and it took a while to download to my computer. At 10:04 last night I started playing and this darn thing kept me up till midnight. 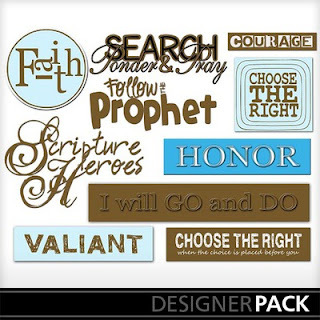 There are SOOOO many papers, embellishments, tags, designs, and colors I couldn't stop myself. Basically, to get this deliciousness you just add the software to your cart, purchase (using my discount code below for $10 off! ), and immediately download it to your computer. Open the software program and get to work! SOOO EASY! This software program is super user friendly. I pretty much figured it all out without any assistance, but they have plenty of information on everything from, "where are my downloaded files?" to "what are my printing options?" You can also find video tutorials here. 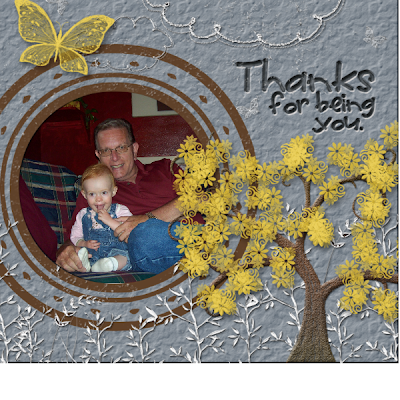 The software purchase includes hundreds of pages, embellishments, frames, shapes, and doo dads, but My Memories also has a huge store with scrapbook kits and extras. Don't forget to check out the Dollar Store! I also downloaded a BUNCH of free extras, too! All of these downloaded extras will pop right up into your software too! This program really does make it so easy for everyone. 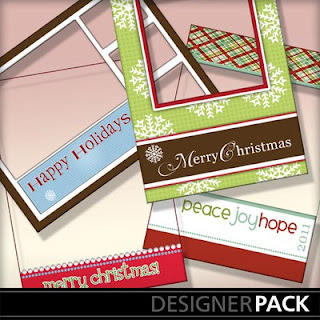 If you need quickie, choose the pre-designed photo books, scrapbook pages, and card templates. Like this one I threw together for my dad. 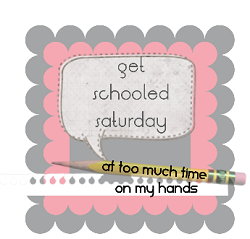 If you have more time and feel creative design your own, like this new button for my "Get Schooled Saturday" linky party! So, here is the deal people.One person will win the My Memories Suite v.3 all for yourself! I will be hosting a GIGANTIC giveaway on February 14th to celebrate my blog anniversary, so come back and enter to win then! But, if you can't wait...and I get it, I am an impatient sort myself, you can purchase a copy right now for $29.97! If you are going to go buy the My Memories Suite v.3 use this code for $10 off your order! Don't forget to check back here on FEBRUARY 14th! Hi Kim! 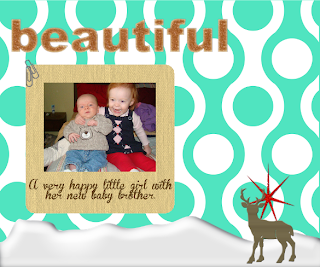 Thanks so much for the invite to your link-up! I read the email too late..oh well..I saved your address and I will link up this weekend! I also have a link up going on Thursdays and would love it if you would link something up to mine too! I SO UNDERSTAND not being able to finish a scrapbook... I started one for my daughter / oldest grandson. I got to where she was pregnant. Used a silhouette of a pregnant woman and put in an ultra-sound picture in the belly (super cute!) That's as far as I got basically. This grandson will be 7 years old in March!! (And... now there's a younger brother too!) LOL I will have to come sign up for your giveaway on 2/14... maybe I could use that process?!?!? !